Maximum comfort,optimum handling and a long list of functions: a masterpiece of Swiss precision. The BERNINA 350 offers the highest precision, allied with tried-and-tested Swiss quality. The BERNINA 215 provides you with everything you need for a good start in creative sewing. 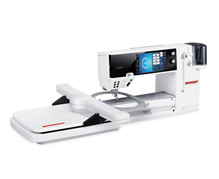 The BERNINA 1008 offers the flair of mechanical sewing with high precision and a wide range of setting options.